I haven’t stopped pondering the questions and points Carol A. Hand – Voices from the Margins poses within the context of this posts. I came away with a large sense of hope and deep excitement. A course that to me would truly nurture learning in addition to forward thinking educators encouraging us to look beyond todays status quo. The video is just a cherry on top of an already, brilliant article. 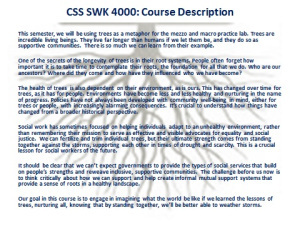 Wow love the tree and root idea so brilliant!!!! Yes, me too! Drew me in immediately! You’re welcome, Carol. So grateful to share such insights. My husband and I have used it as a conversation piece every evening. I’ve even shared it with my mom, well she read it on here. So wonderfully thought provoking, a strong foundation to build from.